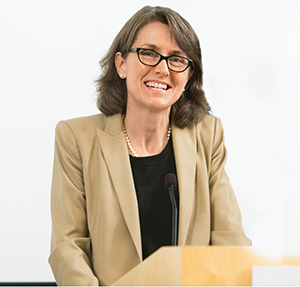 The Lesbian and Gay Veterinary Medical Association honored Deborah Kochevar, dean of the Cummings School of Veterinary Medicine, for her efforts to promote inclusion and diversity within the veterinary profession. The LGVMA presented one of two 2013 Leadership Awards to Kochevar during the group’s annual meeting in July, held in conjunction with the annual meeting of the American Veterinary Medical Association in Chicago. The first veterinary school dean to join LGVMA, Kochevar received the leadership award along with James Lloyd, dean of the University of Florida College of Veterinary Medicine.